Loved it and the music enhanced the words. I would like to purchase a copy to share also! Don’t ever stop doing what you’re doing! You made me believe in love again! I need three more copies! Blown away in the most literal sense of the word! I truly appreciate your support and thank you in advance for the LOVE! Habari Gani? That’s Swahili for “what’s the word” and the word is I will be joining the phenomenal Sistahs Laying down Hands at the African American Museum in Philadelphia! The festivities begin December 26th and I, Toni Love will be joining the Sistahs on Saturday December 29th during the closing ceremony. The full day, family friendly program is FREE with museum admission but please register at http://www.aampmuseum.org . Hope to see you! 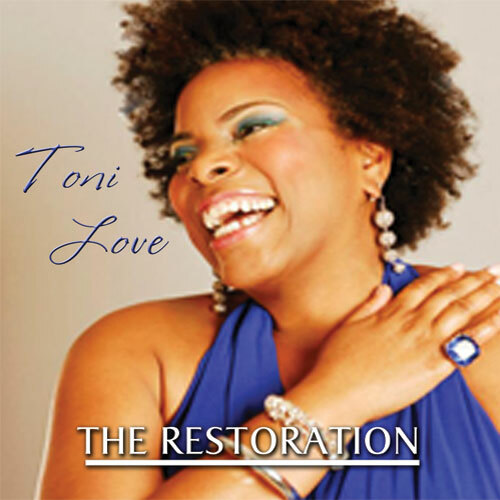 Do you have a copy of The Restoration? There are a few special edition CDs left! Click on the photo to listen to two of the tracks and purchase a copy for yourself. Thank you in advance for the love! How many have heeded the call of the golden waterfall at the end of the moon’s shadow? Mother’s Day is always bittersweet for me. I know as a Mother that there is pressure to smile and gush at the numerous mother’s day wishes, cards and love from my kids, but even after seventeen years, I still awaken with a small void knowing I can only speak the sentiment to my own mom, and seek to hear her respond in soft whispers of the wind. When I was asked to collaborate with the phenomenal drummers and artists Sistahs Laying Down Hands for Mother’s Day I immediately said yes. Every performance together has been a gift to me and as I tapped into my intuition I knew that I needed to be in that space on that day, I just didn’t know why. I chose to recite a poem I wrote as part of my grief work after my mother transitioned. I was in my first trimester and I thought God to be so cruel to take my mother when I was first becoming a mother. Writing helped me come to terms with the loss and my faith and I recite this poem to help other motherless children feel that it’s okay to speak the pain of grief and release it. I didn’t know that at the dawn of Mother’s Day this year I would be admitting my first-born to the hospital after spending hours in the emergency room. Everything in me wanted to cancel the performance but I had committed and my son told me “you should do it Mom, I know you’ll be good”. So with little sleep and a strained voice I sang and performed my poem surrounded by the healing energy of the drum. It was where I needed to be and I am grateful for the opportunity to receive the strength and the spiritual support through art. My poem is about 5 minutes in, but you will want to watch from the beginning for a wonderful spoken word of remembrance of mothers and of course the powerful hands of the Sistahs Karen Smith and Miriama Koroma! You can search this blog for the words to the poem. Browsing through my Facebook feed I come across a notification that a friend tagged me in someone’s post. As one who is both a businesswoman and artist I know a diverse group of people and am a bit picky about what I’m tagged in with the permanence of social media. Much to my surprise I saw the photo taken of me last year posted on the photographer’s Facebook page and appeared both digitally and I’m print on page 5 of the Philadelphia Inquirer! The #strengthsourceproject is this beautiful collage of photos and stories capturing the moments that built the character and resilience of women of all colors, ages, shapes and class. It’s a brilliant compilation and I’m honored to be a participant. If only you knew how sad I felt that day. I had just found out my daughter was diagnosed with dysgraphia, a severe learning disorder that makes it difficult and frustrating for her, an advanced reader to process writing. The same exact day my son’s school counselor called about him exhibiting signs of anxiety and depression (the dance partners of a highly gifted and intuitive brain), avoiding teachers and classes as a result. As their sole caretaker l was overwhelmed with the decisions I had to make on my own knowing I would also not receive the financial support. I was going to cancel the meeting I set with Carrie for the photo because I just wanted to go somewhere and cry. I wore bright colors on purpose to lift my spirits. She was so warm and compassionate when I met her in Fishtown by Franny Lous Porch and reading the other women’s stories really gave me the strength to deal with it all. And oh the blessings that have come because I showed up! Aside from this acknowledgement in the paper, since that day my children have benefited from angels in the form of teachers and therapists. My daughter has been tutored by a retired teacher for free and my son’s therapist only charges me a tenth of his normal fee because I was transparent and unafraid to speak my truth and ask for help. February is extremely full with so many opportunities to show what I love ❤ to do most! The Producer’s Guild and the Community Education Center present Karen Smith and Sistahs Laying Down Hands in concert!! Featuring, Shanita Jackson Donna Jean Reviere Dorman, Toni Love, Mariama O’Brien and Jamila Hammond- Hendricks! I hope to see you at the Second Fridays celebration 3500 Lancaster Avenues, Philadelphia PA.
M. Tonita Austin, Tamara Diaz, James Dupree, Tim Okamura, Petronia Paley, Eva Preston, Danny Simmons and Richard Watson. Artist, Kathleen Spicer sits down with me to remember her late husband, renown painter, sculptor, Mr. Charles Searles who was also my great mentor and teacher. Read additional, compelling interviews with Artists: James Dupree, Tim Okamura, actress and visual artist, Petronia Paley, Danny Simmons and Richard Watson. Click the link to go inside. Stand by for details on how to collect this beautiful edition in print. Cover Art by Tim Okamura.